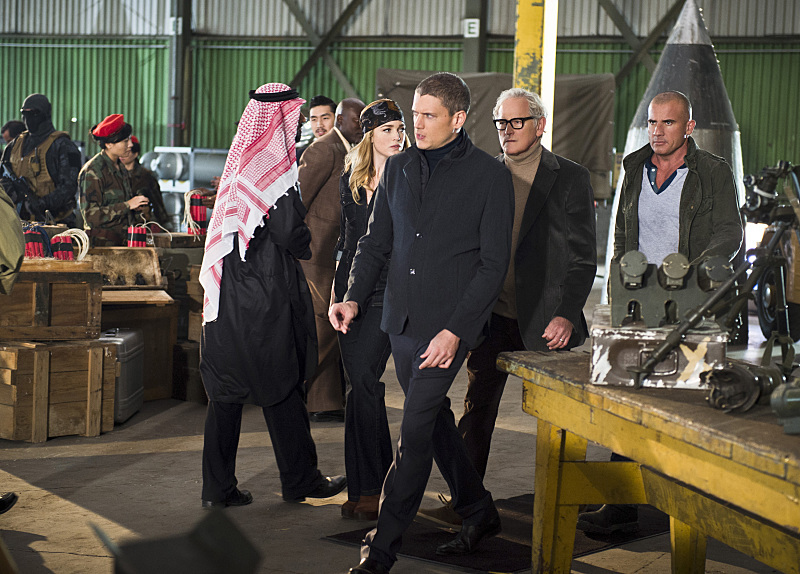 DC's Legends of Tomorrow -- "Pilot, Part 2" -- Image LGN102_20150917_0182b.jpg -- Pictured (L-R): Caity Lotz as Sara Lance/White Canary, Wentworth Miller as Leonard Snart/Captain Cold, Victor Garber as Professor Martin Stein and Dominic Purcell as Mick Rory/Heat Wave -- Photo: Diyah Perah/The CW -- ÃÂ© 2015 The CW Network, LLC. All Rights Reserved. It is part 2 of the Pilot for DC’s Legends of Tomorrow and our time travelers are still in 1975 but this time they are in Norway. According to Professor Boardman’s journal, the figure that Savage would be there. The team gets wind that Savage will be at an illegal arms deal auction. An argument ensues between Snart, Rip and Ray as to who should be in charge of the mission. Ray and Snart do agree that it won’t be Rip. One of the features of the Wave Rider is a clothes maker that outfit our Legends in 70s garb. Snart is unable to get the team into the auction but Stein does by claiming they are a gang not to be messed with. The team learn that Savage isn’t a buyer but the seller of a nuclear war head. The bidding starts and people show interest by shooting their guns in the air. Among the buyers is Damien Darhk looking exactly like he does in 2016 Star City over on Arrow. While the auction is going on, Savage senses Carter and Kendra, who are Hawkman and Hawkgirl stand by with Jax. Stein asks Rory to shoot his gun to make them bidders as they were drawing too much attention to themselves. However, no one else bids and Stein becomes the owner of the nuke. DC’s Legends of Tomorrow — “Pilot, Part 2” — Image LGN102_20150917_0287b.jpg — Pictured (L-R): Neal McDonough as Damien Darhk, Casper Crump as Vandal Savage and Dominic Purcell as Mick Rory/Heat Wave — Photo: Diyah Perah/The CW — ÃÂ© 2015 The CW Network, LLC. All Rights Reserved. Darhk goes over to congratulate the team and so does Savage. Stein gets a bit cocky and makes a slip in front of Savage that indicates they aren’t from this time. Soon a fight ensues between Savages men and the Legends. When Stein gets caught, he asks Ray to get into the fray (Ray as the Atom was hiding in Stein’s pocket. Jax arrives and merges with Stein. So everyone is using their particular set of skills to fight. We see that a piece of the Atom’s suit falls off during a fight. Hawkman and Hawkgirl arrive and confront Savage but he leaves by setting off the nuclear missile. The Atom tries to disarm but instead sets off the fail safe that speeds up the timer. Firestorm takes the nuclear war head a safe distance away and absorbs the blast. Back on the Wave Rider, Rip congratulates them on a botched mission and notes that Ray left a piece of his suit behind that Savage reverse engineers to use for his own nefarious purposes like destroying Central City in 2016. So set things right, Stein proposes paying his younger self a visit as he developed a tech that can help track the part from Ray’s suit. Meanwhile, Snart, Rory and Ray will steal a dagger that can kill Savage. The discovery of this dagger is thanks to a newspaper article that Carter found in Boardman’s suit. Kendra recognized it as the weapon that killed them in their first lives and features writing that she can only read as a Egyptian High Priestess but can’t. Stein, Jax and Sara venture to Ivy Town and find Marty Stein. Sara is all flirty with Marty and manages to gain access to his lab by going off with him to smoke a doobie. Sara and Jax can’t believe that Marty and Stein are the same people the younger one seems much cooler but still arrogant. While Marty is distracted, Stein finds the radar that can track part of the Atom suit. Stein talks about it was at this time period that he met his wife. Marty arrives and catches the trio taking his radar and demands to know what is going on. Stein tries to talk his way out of it but is not really doing a good job so Sara knocks him out. Stein sets an alarm so his younger self will wake in time to attend a faculty mixer where he meets his future wife. Meanwhile over at Savage’s lab, he gives his team 24 hours to reverse engineer it and kills one of his men when said that isn’t possible. DC’s Legends of Tomorrow — “Pilot, Part 2” — Image LGN102a_0292b — Pictured: Caity Lotz as Sara Lance/White Canary — Photo: Jeff Weddell/The CW — ÃÂ© 2015 The CW Network, LLC. All Rights Reserved. With the device in hand, Stein, Jax and Sara find the lab. Sara in her White Canary garb takes care of the men and grabs the piece of the Atom suit. When they return to the Wave Rider, Stein notices his wedding ring go missing which means his younger self did not meet Clarissa. In fact, Marty is on the Wave Rider demanding what is going on. Stein is arguing and getting frustrated with his younger self when Jax pulls him over to talk sense into him. Eventually, Marty does get off the Wave Rider and thanks to a phone call from Rip, he does go to the mixer and does meet Clarissa therefore Stein’s wedding ring returns. DC’s Legends of Tomorrow — “Pilot, Part 2” — Image LGN102_20150922_0035b — Pictured (L-R): Brandon Routh as Ray Palmer and Leonard Snart/Captain Cold — Photo: Diyah Pera/The CW — ÃÂ© 2015 The CW Network, LLC. All Rights Reserved. The trio go to the home of the supposed Russian that now owns the dagger. After talking out a couple of guards, the three make it in and start smashing display cases. Ray doesn’t want Snart and Rory to steal more than just the dagger and a fight ensues that ends up setting off an alarm and trapping Ray and Snart (Rory was off to find the house’s safe). As Ray and Snart work to get out, the two swap stories. Rory arrives and says the owner has come home and the owner is Savage. Savage figures they are from the future and demands they call their team and looks forward to seeing two of them. DC’s Legends of Tomorrow — “Pilot, Part 2” — Image LGN102_20151006-0188b — Pictured (L-R): Ciara Renee as Kendra Saunders and Falk Hentschel as Carter Hall — Photo: Diyah Pera/The CW — ÃÂ© 2015 The CW Network, LLC. All Rights Reserved. Kendra tells Carter that she cannot read the writing on the dagger. Carter then gets her to meditate to remember her life as Shayera. When Kendra closes her eyes, she remembers of a time when she as Shayera and Khufu were making love. Carter takes this as a sign that she remembers their love and goes to kiss her but she pulls away. Kendra later apologizes and tells Carter that she was trying to fight their destined love. Carter tells Kendra that she doesn’t have to fall in love with him in this time line. Kendra tries again to remember her first life. This time, Kendra remembers Khufu giving Shayera the dagger and the inscription is a love poem about being together forever. This seems to have triggered something in Kendra. The team receives the SOS from Snart, Rory and Ray. The team fights off Savage’s men while Hawkman and Hawkgirl, now armed with the dagger confront Savage. Hawkman stabs the dagger into Savage but nothing happens. Instead, Savage takes the dagger and uses it to kill Hawkman and absorbs his life force. Kendra goes to Carter who says he will wait for her and asks her to come back to him just like he did in their first life and dies. Kendra, in her grief, goes after Savage but he ends up stabbing her. Savage gets away and the team take Kendra back to the Wave Rider. In the medical bay, Gideon manages to stabilize her but Kendra is hysterical stating she remembers her love for Carter and felt the same way as him but never got to tell him. Kendra then falls unconscious. The legends then decide to continue the fight against Savage in Carter’s memory and are off to their next time destination. And wow, I can’t believe they killed Carter Hall!!! How can Hawkgirl not have her Hawkman? I was shocked and disappointed that Falk Hentschel was going to be off the show but reading some post-mortem articles, it doesn’t sound like it in that we will see some form of Carter Hall either in flashbacks or another time period. What I like about Legends of Tomorrow is that it is action packed and funny. Wentworth Miller still looks like he is having a blast playing Captain Cold, love the quips from Dominic Purcell and I especially love this lighter and funnier version of Sara Lance. I can see how much fun Caity Lotz is having on this show. Looking forward to see what adventures this show will bring. had a hard time tracking it down… phew..